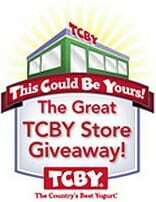 TCBY (the frozen yogurt stores) is holding a competition to give away a brand new TCBY franchise store for FREE. To enter you must create a video up to 2 minutes long indicating why you should win a TCBY store. Complete the application form and submit it with your video. Legal residents of the U.S. who are 21 and older are eligible to participate. Enter by: November 30, 2009. For more information watch the YouTube video. You can find the complete rules and the application to enter here.